Discussion in 'Tech' started by funkgab, Nov 10, 2007. It really depends. Is there a decent heatsink below the fan? If so you could probably lose the fan and survive. If there's only a wussy heatsink, you may need to replace it or the fan. If you do pull the fan, just keep an eye on the temp. Reach in your computer at feel it from time to time, if the heatsink fins don't burn themselves into your hand, it's all good. You won't need to replace it, but you may have to depending on the temperatures it hits without the fan. If that board has a chipset temperature sensor, keep an eye on it. Chipset coolers are pretty cheap to buy if you do end up needing one. You could just remove the fan and point a case fan at that general area of your mobo. 4 bucks! anything that will allow you to monitor chipset temps besides the bios? My original Abit northbridge fan made a weird vibrating sound so I got a new one from thermaltake, pretty decent and not to expensive. Dying as in making noise? Have you tried adding sewing machine oil to it? 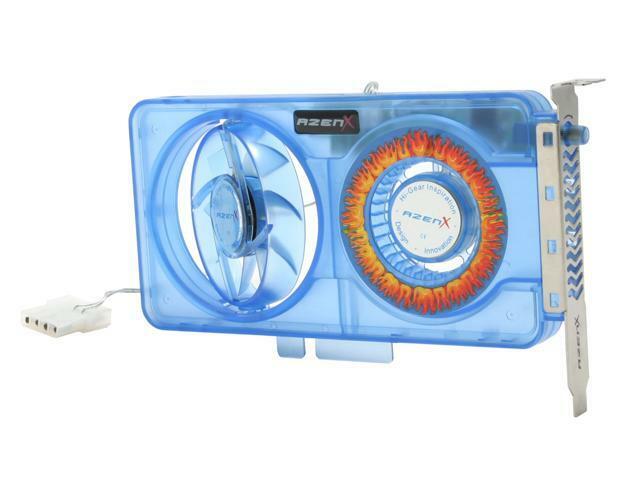 thats a video card fan. does anyone know if u can just replace the PSU fan or you have to buy a whole new PSU? oh and also, can i take the back off my PSU and clean all the dust of the fan? That's a general purpose fan that fits in a PCI slot. I can add extra cooling to a video card though. I wouldn't take remove anything from the PSU. It's very dangerous plugged or unplugged. If your PSU is noisy, buy a whole new one. not the price im worried about, its the size, and msp that looks freaking loud. It was surprisingly quiet. And 2-3 speed settings as I recall. It extended the life of that old card quite a bit. But this particular PC was pretty loud to start with. Lots of case fans, RAID 0 hard drives humming away. I can tell it's on from a lot way off. Unless you know the grounding procedures do not open a PSU ever. cured,iIf you need to open your PSU to replace the fan it's easy. Discharge the PSU by pressing the power button on the PC, press the button, count 3, hit the button again and repeat 3 times and you'll be fine. After the PSU is removed from the box I don't use a grounding strap or worry about touching the metal of the PSU case as I'd rather fry the power supply than me. The caps store mucho juice so even if you have dicharged AOK pretend it is still hot, you'll have no prob. You might need to solder and use heat-shrink tubes or or use crimp type insulated connectors but this is not the place for black tape. I do this every time I work on anything in my rig not just the PSU. thanks everyone and woodbutcher for your advice. For safety you can discharge again out side the box if you wish, connect a fan to the PSU and jump the 20-24 pin mobo plug w/ a paperclip, 95% of power supplies can be jumped by grounding the green pin to any black wire. Google " pinouts for 20-24 pin molex ". Dell at one time used a proprietary psu mobo connector so do the research. Electricity can be very unforgiving, just ask that kid who hosed his X box! i heard about the kid that went inside his xbox and was found unconsious from an eletric shock.